This tortoise has a shell deformity resulting from inadequate calcium and/or D3 intake. This is an entirely preventable problem. Obtaining perfect, natural-looking growth in tortoises and turtles is a multi-factorial challenge. The keeper must balance many different aspects of diet with extraneous (environmental) factors if this is to be achieved. There is no ‘quick fix’ or ‘ABC’ method guaranteed to produce reliable results under all circumstances. Instead, it is vital that keepers understand the basic mechanisms involved. In this series, we will look in turn at various different issues that are critical to producing natural, health growth and briefly discuss how the theory can most effectively be applied in practice. We will start by looking at calcium, and calcium supplementation. 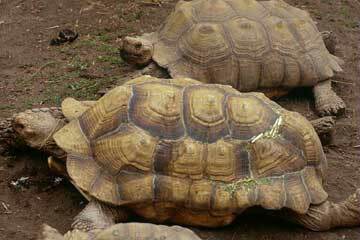 In nature, tortoises obtain their calcium requirement in several ways. The bulk of their requirement is typically supplied by consuming calcium-rich vegetation. This vegetation is itself typically growing on calcium-rich soils, a situation that leads to plants that are themselves rich in this mineral. Tortoises also obtain some additional calcium by incidental consumption of sand/soil particles when feeding, and by deliberately seeking out calcium-rich items in their environment, such as snail shells or sun-bleached bones. Surprisingly, even desert environments often have extremely large snail populations, and it is not unusual to find literally hundreds of estivating snails per square meter, and thousands of particles of broken snail shell in the same area. 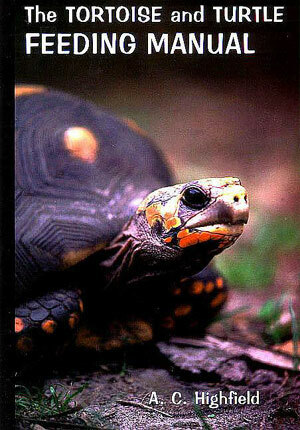 Tortoises have been observed to seek these out, and to consume them enthusiastically. They provide a concentrated, readily absorbed source of this vital mineral. In most captive situations, the gross calcium content of the diet rarely, if ever, approaches that of wild diets, and the calcium-to-phosphorus ratio of captive diets is also typically far lower overall than is seen in the wild. Some typical examples include Plantago sp., with Ca:P ratios of above 20:1 and Opuntia sp., where Ca:P ratios can be as high as 78:1. The typical diets adopted by many keepers, based upon commercial salads and fruit, often contain little calcium and an excess of phosphorus. 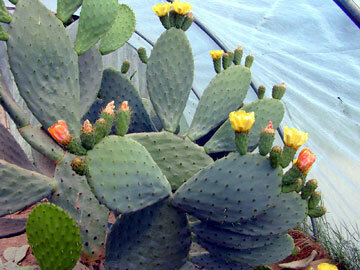 Opuntia cacti - a plant typically rich in calcium with a very high Ca:P ratio. If you keep tortoises, it may be worth cultivating this excellent food source, as shown here. If we can do it in Wales, UK, you can do it almost anywhere. 2) By careful use of calcium supplements. In practice, a combination of both methods is recommended. One problem in relying exclusively upon dietary selection is that many plants that on the surface appear to offer good, or positive calcium-to-phosphorus ratios, also contain chemicals that inhibit calcium take-up. Mustard greens, turnip greens, kale, cabbage, bok choy, spinach, chard and collard greens all fall into this category. One of the best known examples of such an ‘anti-nutrient factor’ is oxalic acid. Another is phytic acid, found in high concentrations in peas, beans and related legumes. It is therefore necessary to screen diets not only for gross calcium content, and calcium-to-phosphorus ratio, but also to screen them to exclude reliance upon plants that contain high levels of these ‘anti-nutrients’. In practice, this is fairly difficult to achieve on an all-year-round basis. Calcium may be delivered in various forms, some of which are more readily absorbed and efficient than others. Calcium supplements based on bone meal are inadvisable due to their inherently high phosphorus content (24% calcium and 12% phosphorus). As most tortoise diets are already rich in phosphorus, supplementing with additional phosphorus is neither necessary nor recommended. According to a recent review of calcium preparations, there are at least a dozen common calcium preparations and hundreds of different formulations available. Calcium carbonate is the most common preparation; some others include tricalcium phosphate, dicalcium phosphate, bone meal, calcium citrate-malate, oyster shell, calcium lactate, and calcium gluconate. These calcium preparations differ in a variety of ways. Calcium carbonate has the highest concentration of calcium by weight (40%), whereas calcium citrate has 21% calcium and calcium phosphate has 8% calcium by weight. Although calcium carbonate has the highest concentration of calcium by weight, this form of calcium is relatively insoluble, especially at a neutral pH. In contrast, calcium citrate, although containing about half as much calcium by weight, is a more soluble form of calcium. Certain preparations of calcium (e.g., bone meal, dolomite) may contain contaminants such as lead, aluminum, arsenic, mercury, and cadmium. Significant amounts were identified in calcium carbonate supplements labeled oyster shell, for example. Chronic intake of these supplements may pose an unnecessary risk. Most commercial calcium preparations are tested for heavy metal contamination. In theory, excessively high intakes of calcium may interfere with the absorption of other nutrients such as iron and zinc, however, in chelonia we are not aware that such effects have been demonstrated. Other potential adverse effects of chronic intakes of high doses of calcium include Hypervitaminosis-D in the case of supplements containing both calcium and vitamin D. Recent human studies indicate that increased intake of calcium does not increase risk of kidney stones. However, restricting dietary calcium may increase urinary excretion of oxalate which in turn increases risk of kidney stones in addition to causing bone developmental problems. As a general rule, calcium carbonate is the preferred source for use as a routine supplement. It is both safe and effective. Limestone powder is available at very low cost in bulk from agricultural feed merchants, and approaches calcium carbonate in efficiency. For emergency use, where commercial supplements or limestone powders are not available, human calcium tablets may be ground to a fine powder and applied to the food liberally (note that while some human calcium tablets may also contain vitamin D, this is usually in the form of D2 rather than D3 as required by reptiles). Some texts recommend the use of ground poultry eggshells as a calcium supplement. While it is true that these do contain useful amounts of calcium (up to 39% available Ca), and have been shown in human studies to help prevent osteoporosis in mammals, it should be noted that for chelonian use, there are a number of potential drawbacks. These include the fact that studies show that such eggshell material also contains hormone traces (with unpredictable effects upon tortoises) and that any remaining egg membrane material can also contain antibiotic traces as well as representing a potential reservoir for contamination by salmonella organisms. Eggshell derived calcium supplements intended for human use are extracted and purified under strict laboratory conditions, and are obtained from poultry on carefully controlled diets. The use of home prepared eggshells from store-bought eggs is not recommended due to the lack of quality control over feed inputs and the potential for contamination with residues due to the difficulty of removing all membrane traces. Cuttlefish bone is a long-standing method of providing extra calcium to tortoises, and especially to turtles, as it floats readily in water. The main chemical constituents of cuttlebone are calcium carbonate, sodium chloride, calcium phosphate, magnesium salts and an abundance of micro-trace elements. Despite its high gross calcium content, cuttlefish bone is relatively poorly absorbed, and as such should not be relied upon as the sole source of calcium supplementation. It can, however, be employed as a secondary source. One form of calcium supplement often sold in pet stores is known as “turtle blocks”. These are mostly made of Plaster of Paris (calcium sulfate hemi-hydrate) combined with calcium carbonate, often in a 50-50 combination. Plaster of Paris itself contains almost no useable calcium, and is merely used to adhere the block into shape. Weight-for-weight, therefore, “turtle blocks” contain 50% or less calcium carbonate, of which, in turn, only 40% may be bioavailable. There are also concerns over heavy metal contamination in gypsum, from which Plaster of Paris is derived. This is not a form of calcium supplementation that we therefore recommend. On balance, the safest and most effective calcium supplements for routine use with captive tortoises would appear to be a calcium carbonate based, phosphorus-free ground calcium powder, preferably of commercial quality, either with or without added vitamin D3. Some specialist suppliers of reptile vitamin and mineral supplements now offer products which have been carefully formulated to provide a much better match to the specific dietary requirements of reptiles than standard supplements, such as Vionate, which were originally formulated for general purpose use. One such supplier, in Britain, is Vetark Products whose Nutrobal high calcium supplement is especially suitable for herbivorous reptiles. In the United States, Rep-Cal is similarly recommended as a phosphorus-free source of calcium and D3. In nature, herbivorous tortoises acquire all of their vitamin D3 requirements as a result of a chemical reaction in the skin, following exposure to the UV-B spectrum of sunlight. A compound is formed that is known as 7dehydroxycholesterol (this is sometimes also shortened to 7DCH or provitamin D). This in turn is converted, by means of temperature, to vitamin D proper. It is vital that both sufficient UV-B plus adequate basking temperatures are available if this process is to function properly. This is one reason why the new UV-B heat lamps (self-ballasted Mercury Vapour lamps) are so good. They provide both UV-B and the heat necessary to convert the 7DCH to a form that can ultimately be utilized by the calcium metabolism. A UV-B fluorescent tube alone will not do this. If such a tube is used, a separate source of basking heat is mandatory. Without an adequate source of heat, the conversion will not take place efficiently. As a general rule, if you live in an area where tortoises and turtles occur naturally and your animals are able to spend at least three or four hours outdoors in unfiltered sunlight daily, you probably do not need to rely upon oral D3 supplements. A calcium supplement alone should suffice. If you live in a northern, cloudy area where tortoises and turtles do not occur naturally, or your animals’ outdoor time is restricted, it is recommended that you do use a supplement on a regular basis. We would suggest three times per week as an absolute minimum. If you provide high output UV-B lamps, and have adequate basking facilities, you may be able to rely upon these to promote adequate D3 synthesis but personally, I would prefer to hedge my bets by supplementing with a combined calcium and D3 supplement orally at least twice a week. • Phosphorus is the second most prevalent mineral in bones and makes up more than half the mass of bone mineral. Thus, the diet needs to have sufficient phosphorus in order to build healthy bones. For most tortoises and turtles, this is not a problem, as most vegetation is rich in this element. When phosphorus levels in the blood are too high, however, the body takes calcium out of the bones to bind with the phosphorus to facilitate its removal from the bloodstream. Bones can become brittle or deformed as a result. Many other micro trace elements are also important, including Manganese, Zinc, Boron and Strontium. These may not be provided by a regular calcium or calcium with D3 supplement alone. An appropriate and varied diet will certainly provide most of them, but a wide-range mineral supplement can also be used to ensure that they are present on a regular basis. We would recommend such a supplement be used no more than once weekly. Carefully consider vitamin D3 requirements. Provide access to adequate levels of natural sunlight, use an adequate and correctly installed and maintained artificial UV-B source, or provide an oral D3 supplement at least 3 times per week. Provide a general broad spectrum mineral trace element supplement (such as Vionate) once per week. Vitamins and Minerals - An outline of these essential dietary elements and what functions they serve. Feeding Redfoot and Yellowfoot Tortoises - Detailed discussion of these tropical, omnivorous species and their diets in the wild and in captivity. High Growth Rates and Vitamin D3 - Discussion of some interesting issues concerning shell deformities, D3 toxicity, etc. Do Tortoises Need to Drink? - Find out here. Dealing with Dietary Addictions - What to do if your tortoise is addicted to a bad diet or is a "fussy feeder"
Available from Carapace Press. The basis of this article and a highly comprehensive discussion of the many issues surrounding the nutritional management of captive tortoises and turtles. This book has received 5-star reviews and is highly recommended to all keepers. The T-Lady's Online Guide to Mediterranean Tortoise Care - Lots of excellent advice on growing and choosing "weeds" to provide a natural diet. Walkbout Farms - Very useful reference materials on reptile nutrition.